I did this one strictly with a palette knife to augment my traditional approach, and prevent me from getting too “knit picky”. I used more color to express lively personality, even though she was rather sedate for this sitting. This gal is a real cowgirl, riding in rodeo’s, roping and barrel racing. 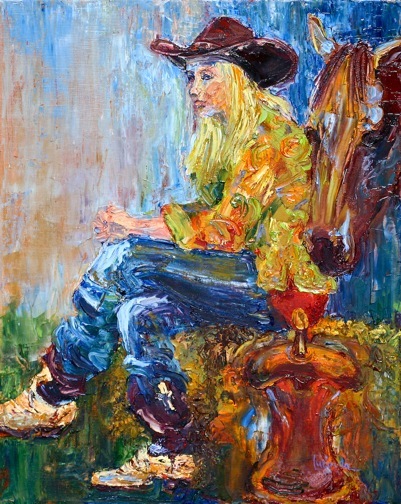 My purpose with Cowgirl Contemplating was to paint a horse, but not to have it the main focus – as horses are dear to my heart. This was far more difficult that you might imagine!